Large movements in house prices can have broad and substantial effects on the macroeconomy. This column uses property-level data to identify the key drivers of house price volatility and decompose this into national, regional, local, and idiosyncratic components. There is substantial cross-sectional variation in house price risk, with higher firm concentration, employment volatility, and manufacturing share of output and employment associated with greater risk. Kuhn et al. (2018) recently explored the importance of asset prices for wealth inequality by reconstructing income and wealth survey data. They were able to show that the bottom 50% of income earners are highly leveraged and have a portfolio that consists almost exclusively of real estate. This contrasts with the middle class, which holds housing and some equity, and the top 10%, which almost exclusively holds equity. From this we can infer that changes in wealth inequality tend to depend primarily on asset price movements. When house prices grow faster than equity prices, wealth inequality shrinks. And when house prices fall, as they did after the 2007-2009 financial crisis, the bottom 50% of the income distribution faces a dramatic reduction in their wealth. This suggests that house price dynamics are particularly important for the financial security of the bottom 50% of income earners. Existing work has explored house price growth, especially in the years surrounding the financial crisis, but less has been done on house price volatility. In Hull et al. (2018), we assemble a novel dataset of all housing transactions in Sweden between 2009 and 2017. We use this dataset to measure volatility at the national, regional, and local level, and to examine its drivers. We first consider whether exposure to firm-specific shocks leads to an increase in house price volatility. We do this by computing firm concentration at the local level. We found that a one-standard-deviation increase in this measure is associated with a 0.82 to 1.26 percentage-point increase in house price growth volatility. For the median property, this would be equivalent to a 7% to 11% increase in volatility. This suggests that living in an area with relatively few sources of employment leaves homeowners more exposed to idiosyncratic shocks to individual firms. Hartman-Glaser and Man (2017) and Peng and Thibodeau (2017) find a positive association between local income volatility and house price volatility. We examine whether this association also holds at higher levels of geographic aggregation, focusing specifically on employment growth volatility, which is closely related to income volatility. We find that a high share of region-level house price volatility is explained by employment growth volatility. Thus, an individual who lives and works in the same location is likely to simultaneously experience either high or low volatility in both labour income and house prices. This could be suboptimal from a portfolio choice perspective. Most high-income countries have experienced a decline in manufacturing’s share of output and employment since the 1970s. Carvalho and Gabaix (2013) suggest that manufacturing’s decline could explain the decrease in output volatility during the Great Moderation, since manufacturing is a high-volatility sector. Furthermore, Howard and Liebersohn (2018) have shown that manufacturing’s decline appears to be positively associated with house price growth in regions with inelastic housing supply. This suggests that a non-trivial component of house price dynamics may have been driven by manufacturing’s decline as a share of output and employment since the 1970s. We explore this question by exploiting regional variation in house price volatility over time. We find that a higher manufacturing share of output and employment is associated with higher house price volatility. Furthermore, this volatility seems to operate at least partly through employment volatility. That is, when manufacturing share is high, employment volatility is high, which translates into high house price volatility. For the median property, a 10 percentage-point increase in the manufacturing share is associated with 10% to 21% increase in house price growth volatility. For example, moving from an identical property in Stockholm, the least manufacturing-intensive region, to Kalmar, the most manufacturing-intensive region, would imply an increase in house price growth volatility of between 27% and 53%. Much of our research focuses on cleanly identifying sources of house price volatility by exploiting time and geographic variation. But we also attempt to discover the aggregate implications for house price volatility. We show, for instance, that sufficiently large regional house price shocks can have a meaningful impact on national house price indices. We also measure the impact of the decline in manufacturing’s share of output on aggregate volatility. Using our estimate for Sweden, we compute the implied changes for the US, UK, and Japan (Figure 1). The implied reductions in volatility attributable to manufacturing range between 1.5 and 3.5 percentage points. For Sweden, the magnitude of the decline implies a 32% decline in house price growth volatility. Source: Hull et al. (2018). 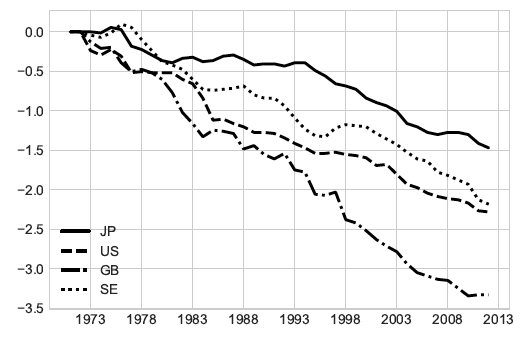 Notes: The plot shows the simulated partial declines in house price volatility for Japan, the US, the UK, and Sweden since 1970. Each series was constructed using the manufacturing employment share for each country, computed by the US Bureau of Labor Statistics, as well as the estimated relationship between employment share change and house price volatility for Sweden. As shown by Kuhn et al. (2018), house price dynamics are the primary driver of wealth accumulation for the bottom 50% of income earners, and so both the growth rate and volatility of house prices have important implications for welfare. Granular sources of volatility, such as exposure to firm specific shocks, exposure to the manufacturing sector, and employment growth volatility appear to be important drivers of house price volatility. This has important implications for macroprudential policy and portfolio choice. In particular, it suggests that variation in property-level house price risk makes housing ownership more attractive in certain geographical areas. It also implies that optimal household portfolio composition varies by geographic region, and suggests that mortgages may be mispriced if they do not consider the granular sources of house price volatility that drive regional and local comovement between labour income and house prices. Carvalho, V and X Gabaix (2013), "The Great Diversification and Its Undoing", American Economic Review 103(5): 1697-1727. Hartman-Glaser, B and W Mann (2017), "Collateral Constraints, Wealth Effects, and Volatility: Evidence from Real Estate Markets", SSRN working paper. Howard, G and J Liebersohn (2018), "The Geography Channel of House Price Appreciation: Did the Decline in Manufacturing Partially Cause the Housing Boom? ", working paper. Hull, I, C Olovsson, K Walentin, and A Westermark (2018), "The Granular Origins of Aggregate House Price Volatility", Sveriges Riksbank working paper 349. Kuhn, M, M Schularick, and U Steins (2018), "Income and Wealth Inequality in America, 1949–2016", CEPR Discussion Paper 12218. Peng, L and T Thibodeau (2017), "Idiosyncratic Risk of House Prices: Evidence from 26 Million Home Sales", Real Estate Economics 45(2): 340-375.